Thanks to its long experience and know how CIMMA supplies classifying systems by mechanical screening, in cooperation with first class Italian and Foreign specialized companies, and independent air classifying units (air selectors and micro-classifiers). 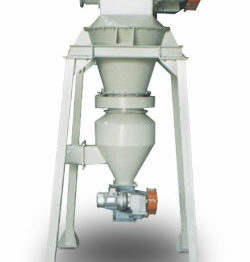 Besides the independent classifying units, CIMMA produces a wide range of pulverizers with built-in air selector. Cimma’s technical staff supports clients for the research to optimal technical solutions, also with the available research laboratory and equipment for semi-industrial tests.